Hermione never thought the party would be over, if it wasn&apos;t for Draco, she would have asked someone who could shoot Avada Kedavra at her. No wonder why Draco wanted her there. It was so boring and nothing happened.
" I know I sound rude, Draco, but when is this party over?" She whispered to him.
" Depends on, what time is it?" Hermione shrugged. " I don&apos;t know, maybe around 11 pm"
" Well, then it&apos;s three hours left" he said simply.
" What?!" Hermione screamed and almost dropped her glass full of firewhiskey. But Draco just chuckled.
" I&apos;m just kidding. It&apos;s like 30 minutes left or something like that. Why? Bored?" " Believe me or not, but I would rather have divination with professor Trelawney now than this"
Draco tried to hide a smile but Hermione saw it. " Wait, that&apos;s why you asked me to come here! You didn&apos;t want to be forever alone when you knew that this party is so boring"
" Something in that direction, but it&apos;s not the main reason that I asked you to come here" Hermione turned to him and looked him in the eyes.
" Oh yeah? Why did you really?" " I&apos;ve already told you. No one in my family knows what love is. I know that you do" Hermione sighed and looked at him with a hopeless look.
" Oh Draco...." She took his hand and walked straight to the dance floor.
" What are you....?" He said.
" Dance with me and I&apos;ll try to explain it to you"
Draco took a grip around her waist and pulled her closer to him. Hermione laied her arms around his neck and looked into his eyes.
" Tell me" He said, in the corner of his eye he saw his parents look at them. Both of them looked very...proud and happy. " What is love?" " It&apos;s when you put someone else&apos;s needs in front of your own. It&apos;s when you&apos;re ready to do whatever for the ones you love"
" But..." Draco tried to cut her off but she was faster.
" 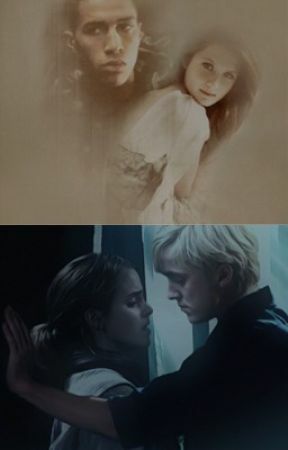 Love isn&apos;t always perfect Draco, it&apos;s not a fairytale. It&apos;s a something you work on and fight for. It&apos;s impossible to live without"
Draco could see how his parents shot a few glances at each other. He prayed to the stars that they had heard it all. If he was lucky, they had.
" Wow...." He said. " You are amazing Hermione Granger"
He leaned in and was so close to her mouth but she turned away from him.
" Come on I&apos;m not that hideous"
" Just because it&apos;s Christmas, you can have this one"
She leaned in and gave him a sweet and long kiss on his cheek.
" It&apos;s good enough" Draco said when she pulled back. " For now"